Steve Rhone, President of Weston Forest, is pleased to announce the company is one of 37 recipients of the 2018-19 Canadian Business Excellence Awards for Private Businesses. This is the third year for these awards, presented September 25th, 2018 in Toronto by Excellence Canada. This is the second consecutive year Weston Forest has received this recognition. Canadian Business and Maclean’s today ranked Weston Forest No. 334 on the 30th annual Growth 500, the definitive ranking of Canada’s Fastest-Growing Companies. Produced by Canada’s premier business and current affairs media brands, the Growth 500 ranks Canadian businesses on five-year revenue growth. Growth 500 winners are profiled in a special print issue of Canadian Business published with Maclean’s magazine and online at CanadianBusiness.com and Growth500.ca. Weston Forest made the 2018 Growth 500 list with five-year revenue growth of 193%. 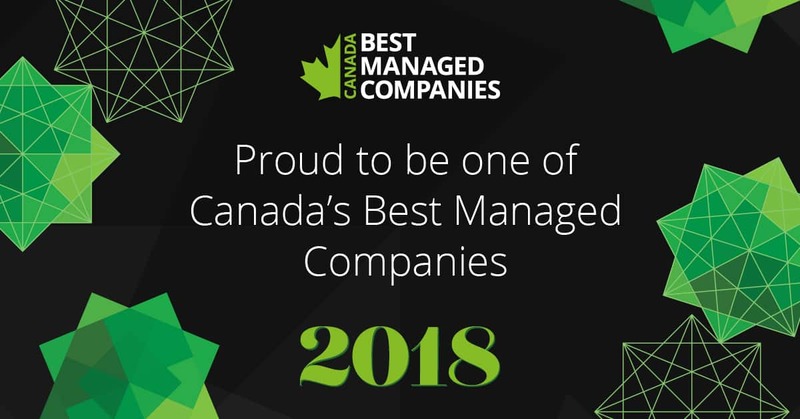 Steve Rhone, President of Weston Forest, is pleased to announce that the company has once again qualified as one of Canada’s Best Managed Companies. Weston Forest won its initial Best Managed award in 2014 and has successfully retained its status, becoming a Gold Standard winner in 2018. Steve Rhone, President of Weston Forest, is pleased to announce that Weston Forest is one of 25 recipients of the 2017-18 Canadian Business Excellence Awards for Private Businesses. This is the second year for these awards, presented by Excellence Canada and PwC Canada. Read more here. Canadian Business and PROFIT today ranked Weston Forest No. 315 on the 29th annual PROFIT 500, the definitive ranking of Canada’s Fastest-Growing Companies. This is the third consecutive year that Weston Forest makes an appearance on the list. Published in the October issue of Maclean’s magazine and at CanadianBusiness.com, the PROFIT 500 ranks Canadian businesses by their five-year revenue growth. Weston Forest made the 2017 PROFIT 500 list with five-year revenue growth of 181%. Read more here. Mississauga, Ontario – March 9, 2017. Steve Rhone, President, is pleased to announce that Weston Forest has once again been acknowledged as one of Canada’s Best Managed Companies for 2016. This marks the third consecutive year that Weston has received this prestigious award. Mississauga, Ontario- December 2, 2016. Weston Forest is honoured to be recognized as one of Canada’s 10 Most Admired Corporate Cultures. The annual award, presented by Waterstone Human Capital, identifies best-in-class Canadian organizations for having cultures that have helped them enhance performance and sustain a competitive advantage. Mississauga, Ontario – September 22, 2016. Weston Forest is pleased to be recognized at the Energy into Action conference with an Energy Innovation Award for the Industrial category between 251-999 KW. This is the first year these acknowledgments have been awarded. Mississauga, Ontario – September 15, 2016. Canadian Business and PROFIT today ranked Weston Forest No. 344 on the 28th annual PROFIT 500, the definitive ranking of Canada’s Fastest-Growing Companies. Published in the October issue of Canadian Business and at PROFITguide.com, the PROFIT 500 ranks Canadian businesses by their five-year revenue growth. This is the second consecutive year that Weston Forest has achieved this honour. Weston Forest posted a five-year revenue growth rate of 150%. WESTON FOREST REQUALIFIES AS ONE OF CANADA’S BEST MANAGED COMPANIES. Mississauga – March 9, 2016 Today, Steve Rhone, President of Weston Forest, is pleased to announce that Weston Forest has requalified as one of Canada’s Best Managed Companies for 2015. Rick Ekstein, President and Chief Executive Officer, is pleased to announce that Weston Forest has just been recognized by Canadian Business magazine’s PROFIT 500 report, as one of the fastest growing companies in Canada. Weston Forest had a five year revenue growth of 72%. Chicago, Illinois – April 1, 2015. Phil Duke, NAWLA’s 2014 Membership Committee Chairman, established “The Outram Award” to recognize the outstanding recruitment efforts of the dedicated members of the NAWLA Membership Committee. Mississauga, Ontario – March 10, 2015. Rick Ekstein, President and Chief Executive Officer, is pleased to announce that Weston Forest has just been named a winner of Canada’s Best Managed Companies program for 2014, sponsored by Deloitte, CIBC, National Post, Queen’s School of Business and MacKay CEO Forums.